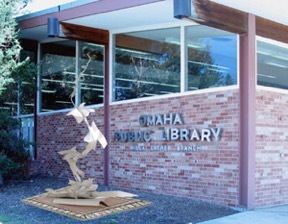 This free-standing metal sculpture creates a literal interpretation of the above quote by depicting larks coming to life from the pages of a novel. With Cather’s words encircling the base, pages fly upward from the open book, morphing into birds as they ascend. The pages begin at approximately 24”x 32”, becoming progressively smaller as they evolve into the size of actual size birds at 6” x 8”. The inchoate flock follows a flight path echoed in wrought iron or metal wire, and the sculpture’s height allows the birds to be viewed both from the exterior as well as from the interior of the library through the north windows. The concept was driven by the students’ determination that reading and imagination would serve as the work’s focus, and the Cather quote fit perfectly. The “two of three human stories” reflect the universality of the human experience, and the students appreciated the circular nature of literature and creativity. Books are full of stories and ideas that transform into dreams, imaginative ideas and endless possibilities, and these birds act as metaphors for ideas and soaring dreams. *This sculpture was damaged, and only the birds remain. They are housed in the Meeting Room.